Occupying a dramatic cliffside location overlooking Koh Samui's picturesque port town of Nathon, Villa Zest at Lime Samui affords guests some of the most spectacular coastal views in Thailand; the wide vistas take in the striking limestone peaks of the National Marine Park, the legendary Five Islands and set the stage for memorable, crimson sunsets which slip right into the horizon, trailing blue and crimson skies. The striking, ingenious design by Bali Based GFAB Architects features open plan living spaces that slide open onto the generous pool and dreamy views — form and function cleverly combined to create a distinctive, modern tropical ambience. Moving away from more familiar villa layouts, the rooms and terraces occupy a single, multi-storied building, staggered with the lay of the land and surrounded by tropical greenery and thriving coconut palms for the ultimate private island hideaway. Villa Zest at Lime Samui extends over three separate levels offering guests an impressive choice of private and communal areas to relax and enjoy the surroundings in style. The expansive property features five bedrooms, seven bathrooms, a pool sala, a fully equipped gym, and a study with its own comfortable terrace and built in sofas, offering a fabulous spot to relax in the tropical warmth. With the huge pool as a focal point, the rooms open onto outdoor terraces at Villa Zest at Lime Samui merge in- and outdoor areas to create a real sense of space and freedom. The Great Room combines a comfortable lounge, dining area and fully fitted western kitchen, each one positioned at different levels connected by steps. Comfortable sofas in the sunken living space are poised before a wall mounted, flat screen TV, while a 10-seater dining table awaits evening meals prepared in the modern, luxury fitted kitchen and fine vintage kept cool in the enormous wine fridge. The entire space slides open onto the pool deck maintaining a constant connection with the dramatic ocean views, and in addition to the indoor dining space, the villa also features an outside dining Sala with BBQ area for the ultimate al fresco feast. Sleep comes easily at Villa Zest at Lime Samui with bright, breezy bedrooms, stylishly furnished with comfortable beds, flat screen TVs, built-in storage and personal safes. Four out of five bedrooms boast free standing bathtubs and all have rain showers. There's also a dedicated children's room close to the living and dining area, which has been kitted out with flat screen TV suitable for 3D movies, as well as several large beanbags for the kids to laze around on. Outside, a trampoline and play area will keep the children happy for hours. 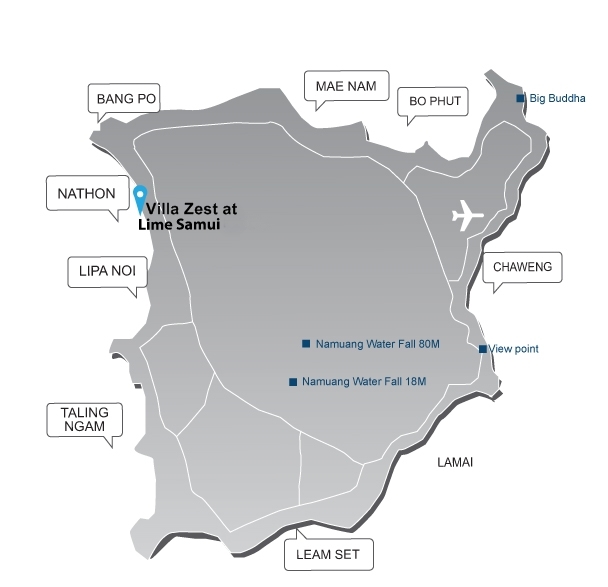 Part of the 12.5 acre Lime Samui villa development, situated in the coconut clad heights above Samui’s picturesque west coast, Villa Zest at Lime Samui is in a secluded, peaceful location about 10 minutes from the town of Nathon. The town offers a choice of simple shopping and dining options, while for more sophisticated entertainment seekers, the excellent beachfront and hillside restaurants and bars at Four Seasons are a 10 minute drive away and world famous Nikki Beach club is around 20 minutes from the villa in Lipa Noi. Daily rates of 5 bedroom start from US$ 1,200 to 2,100 depending on season. Reduced occupancy rates of 3 bedrooms available from US$ 1,000 to 2,100 depending on season.